12V-5V DC/DC Converter from Banggood | Life, The Universe and ... Everything! Testing out this 12V->5V DC/DC converter from Banggood. It's useful useful for 12V deployments with of a Raspberry Pi (which needs 5VDC). It also terminates with a microUSB plug, which goes directly into the Pi -- no need for any hacks. I measured the Pi 3 using roughly 90mA @ 12V on idle, and around 320mA @ 12V with all four core fully loaded, display, andUSB keyboard/touchpad connected. 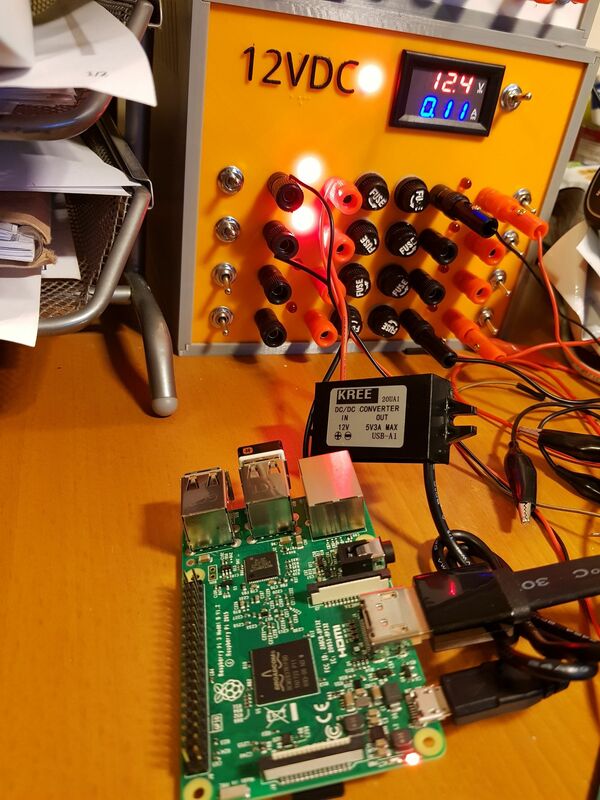 No low-voltage indicator appearing on the Pi's display during peak loads. I didn't notice any heat on the power converter after running for around 15 minutes. Silent too. I measured continuity between the 12V GND and the USB GND, which is helpful if you have stuff 12V equipment communicating with the Pi. The case also features a mounting bracket. I'm guessing it's not strictly a 12V input, and will handle 14V (battery charging) as well. Will test this one day. Am also planning to put it in an outdoor enclosure to see how well it stands up.